Jeremy Corbyn has denied Labour is in crisis after Ken Livingstone was suspended for comments made defending an MP accused of anti-Semitism. The party leader said there were "grave concerns" about language used in a BBC interview by the former London mayor. But Mr Corbyn said: "There's no crisis. Where there is any racism in the party... it will be rooted out." MP John Mann, who called Mr Livingstone a "Nazi apologist" in a public confrontation, has been reprimanded. The Labour MP had been referring to comments Mr Livingstone made about Adolf Hitler. The row was prompted by the suspension of Labour MP Naz Shah over comments she made about Israel on social media. Mr Livingstone appeared on BBC Radio London defending her and said he had never heard anyone in the Labour Party say anything anti-Semitic. 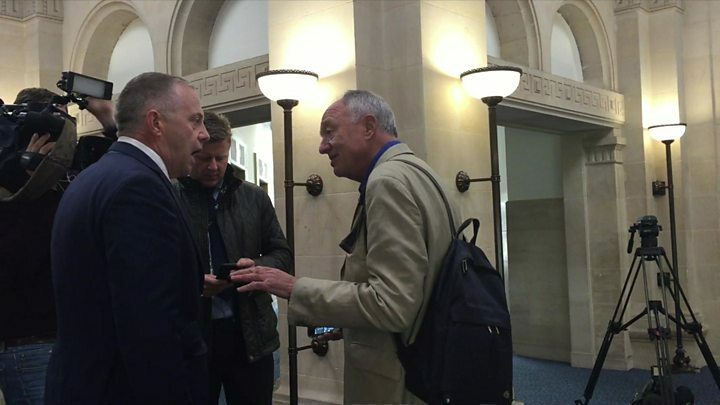 Media captionLabour MP John Mann confronts Ken Livingstone as tensions rise over anti-Semitic claims. Labour MP John Mann then accused Mr Livingstone of being a "Nazi apologist" in front of a media scrum as he arrived at Westminster's media studios. Asked about the confrontation on the BBC's Daily Politics, Mr Livingstone said Mr Mann "went completely over the top" but Mr Mann stood by his remarks. 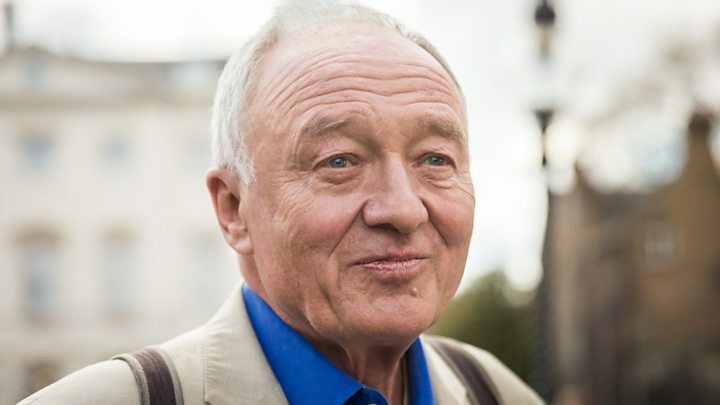 Mr Livingstone said he was not suggesting Hitler was a Zionist, saying the Nazi leader was "a monster from start to finish", but he said he had simply been quoting historical "facts". 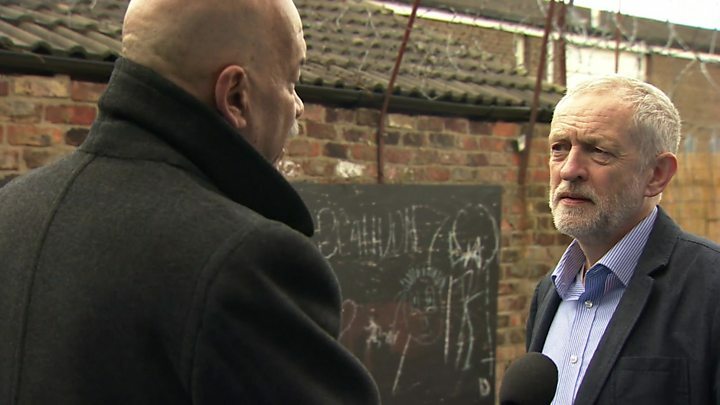 Labour leader Jeremy Corbyn said his long-time ally had been suspended amid "very grave concerns about the language he used in the interview this morning" and would face an investigation by the party. He told BBC deputy political editor John Pienaar: "Anybody that thinks this party is not cracking down on anti-Semitism is simply wrong. We have suspended where appropriate, we have investigated all cases. We will not tolerate anti-Semitism in any form whatsoever in the party." Asked if there was a crisis in the party, he said: "It's not a crisis. There's no crisis. Where there is any racism in the party it will be dealt with, it will be rooted out." He said those who suggested the party was in crisis were "nervous of the strength of the Labour Party at local level". Meanwhile, a Labour spokesman said John Mann was told it was "completely inappropriate for Labour Members of Parliament to be involved in very public rows on the television". For years it has been more surprising when Ken Livingstone hasn't raised hackles than when he has. That's why so many Labour MPs feared a miscalculation when their party's leader brought his old comrade back into the fold. But his staggering comments today about Hitler and anti-Semitism crossed a line - they were enough for Jeremy Corbyn to suspend him. But the problem for the leader doesn't end with that act. No one believes that Jeremy Corbyn himself tolerates discrimination against Jews. But on repeated occasions Labour has been slow and clumsy in closing down cases of anti-Semitism among its members when they emerge. Any moments of delay or doubts about the leadership's determination, open the window a tiny crack to the kind of intolerance that the vast majority of the Labour Party, and indeed the public, find appalling. Public denials that there is even an issue could make it even worse. Perhaps in politics as in normal life, the first step towards fixing a problem is acknowledging that it exists. And with only a week before Jeremy Corbyn's first big test at the polls, In elections in London, Scotland, Wales, and all round England, it's the kind of mess, and political distraction Labour could do without. On Wednesday Labour MP Naz Shah was suspended, pending an investigation, over comments she made on Facebook before she became an MP, including a suggestion that Israel should be moved to the United States. She has apologised but it sparked fresh claims from senior Labour figures that the party was not doing enough to tackle growing anti-Semitism in its ranks. 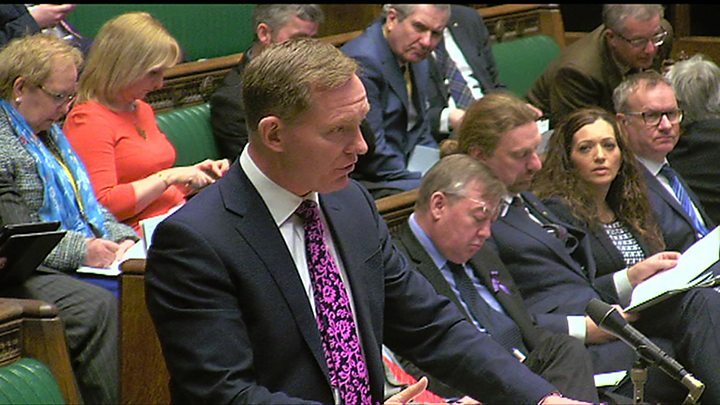 Shadow Commons leader Chris Bryant told MPs: "I'm sick and tired of people trying to explain it away and, yes, I'm talking to you Ken Livingstone." Ken Livingstone's way with a provocative soundbite was the making of him, propelling him to national prominence from the grey world of local government, but it has also got him into a lot of hot water over the years. Not for nothing is his autobiography called You Can't Say That. He was suspended from office as London mayor for four weeks in 2006 for comparing a Jewish journalist to a concentration camp guard - a comment he continues to be unrepentant about, saying it was a "fuss about nothing". The suspension was overturned in court. He remains popular in left wing circles as one of the few socialists to have achieved real power in the UK - but he had largely disappeared from the political scene, following his defeat in 2012 London mayoral contest. He was enjoying semi-retirement when his old friend and ally Jeremy Corbyn was unexpectedly elected Labour leader last year. The two go back a long way. Labour's mayoral candidate Sadiq Khan said: "Ken Livingstone's comments are appalling and inexcusable. There must be no place for this in our party." And Labour MP Rachel Reeves, told BBC Newsnight: "We know we've got a growing problem of anti-Semitism in the Labour Party. But also part of the problem is the slow response from the leadership of the party. We do need to see much swifter and more decisive action." Explaining his stance, in a BBC News Channel interview, Mr Livingstone said Naz Shah was "not anti-Semitic - she was completely over the top, what she said was rude". He added: "I've heard a lot of people being critical of Israel, but if I was to denounce the South African government, you wouldn't say I was racist. "And one of my worries is this confusion with anti-Semitism and criticising the Israeli government policy undermines the importance is tackling real anti-Semitism." "He denies anti-Semitism in Labour when the evidence is there for all to see. He lacks any sense of reality and decency. He must now be expelled from the Labour Party." Prime Minister David Cameron said it was "quite clear the Labour Party has got a problem with anti-Semitism" adding: "They've got to deal with it." Subscribe to the BBC News EU referendum email newsletter and get a weekly round-up of news, features and analysis on the campaign sent straight to your inbox.